Such an intense blue. That tire looks odd sticking up in the air. 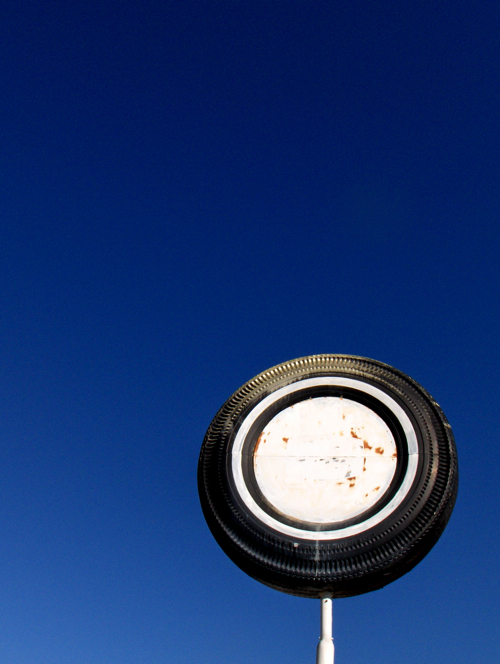 It is indeed an intensely blue sky and the tire seems to accent it! Great shot! Cool photo. That sky certainly is blue! A very creative and unique composition! I like very much this photo! A very clever shot! just when we didn’t think we had any steam left for viewing another Skywatch picture, we opened yours. Terrific! How nice to find one that is a bit different. Probably the bluest, cloudless sky shot of the week. Love the tire-looking sign. It’s an actual tire, kind of a landmark, on South Flores – just south of the courthouse, downtown San Antonio. Real tire, about 8 feet in diameter. The blue sky is from the last few months, the first of the year has been extreme drought conditions in South Texas. Previous post: Water on Wed.